During the summers of 1963 and 1964, Margaret Craske (1892-1990) was my ballet teacher at Jacob's Pillow Dance Festival and University of Dance. 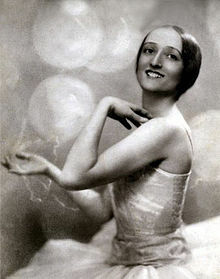 At the time she was also Director of Ballet at the Metropolitan Opera Ballet School in New York City. My first meeting with Miss Craske was when I was fourteen years old and held at the Metropolitan Opera Ballet School. My ballet teacher in Baltimore, Carol Lynn, arranged my audition with her, to see if I would be admitted to the school in NYC after high school. I passed the audition and starting at age sixteen I spent two summers as a work scholarship student at Jacob's Pillow. One of my daily duties was to take care of Miss Craske's room in the morning just before our ballet class. I always felt in awe and did my best at this task, and it gave me a chance to know her a bit. At the end of the second summer I moved to NYC to study with Miss Craske but I realized very quickly that life in NYC was too fast paced for me. I went home and danced with Carol Lynn at the Peabody Institute in Baltimore, and in the Baltimore Opera Company Ballet directed by Carol Lynn. Two years later I began teaching at the dance cooperative at the new city of Columbia, Maryland, and later in Annapolis, Virginia, and California. During my summers with Miss Craske I felt inspired to really dance as an art form based on the rigors of classical ballet. She had an air about her that was uplifting. Unbeknownst to me in my teens, Margaret Craske studied with the Indian spiritual master, Meher Baba for seven years beginning in 1931and became a life-long disciple. I found this out after her death in 1990 at age 97. Around 2010 I was searching on the internet to determine if she had written any books, and it was there I found her book, The Dance of Love, which I ordered and read. I was surprised to read about her experiences with Meher Baba abroad and in the United States. It seems I was more in tune with Miss Craske's spiritual nature than I had realized as I, too, was drawn to Meher Baba on my spiritual quest which I began in earnest in 1977 in Santa Barbara, California. Meher Mount on Sulphur Mountain between Ojai and Santa Paula is a special place to visit. It is the pilgrimage site of Avatar Meher Baba (1894-1969), and 'Baba's Tree' which is an evergreen coast live oak - Quercus agrifolia. This species grows along the Pacific Ocean coast in planting zone nine, between San Mateo to the north and just into Mexico to the south. In the photo you'll see the back side of the tree. The side facing the ocean was burned out in the Ferndale Fire of 1985 that blackened 46,809 acres in the Ojai area. The fire also burned down the main house and barn on this 172 acre pilgrimage site. But this coast live oak recovered and regrew its leaves and today is still growing. The house has since been rebuilt and houses a reception area and library about Meher Baba. I snapped this picture of 'Baba's Tree' to show just how hearty it is now, which is even surprising for a coast live oak. The leaves on this kind of tree remind me of holly leaves because they are thick with points along the outer edges; you wouldn't want to walk on a pile of these leaves in bare feet. The convex leaves higher up in the tree have two layers of cells that perform photosynthesis and nurture the tree through droughts. In fact you wouldn't want to water a coast live oak within the drip line in summer, as the fog along the Pacific coast where they grow is enough moisture for them. They do not grow above the fog line. This tree is growing at 2,500 feet elevation. 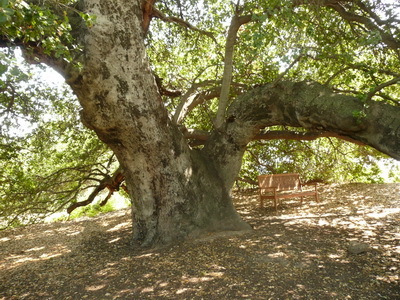 If you wish to make a pilgrimage to Meher Mount and sit under 'Baba's Tree' go through Ojai and take Rt. 150 up the mountain as if driving to Santa Paula. Nearly at the summit you'll pass the entrance to Dennison Park. Go 2.5 miles further. Just past Twin Creek Ranch turn right onto Sulphur Mountain Road and go 2.7 miles to the sign on the left that says Meher Mount. The road gets narrower as you proceed. If coming from Santa Paula take Rt. 150 until you pass the Summit Restaurant. Continue on for 1 mile to Sulphur Mountain Road. Turn left and go 2.7 miles to Meher Mount, which is open Wednesday through Sunday noon to 5pm and closed Monday and Tuesday. I feel that Margaret Craske was spiritually influential in drawing me to the teachings of Meher Baba in the 1970s, even though she never mentioned her discipleship to me when I was her ballet student in the 1960s. I am glad that for eleven years toward the end of her time on earth she served as Director of the Meher Spiritual Center in Myrtle Beach, South Carolina. Margaret Craske and Meher Baba, two great souls, drawing others to spiritual perfection through the uplifting vibrations of their lives. The Dance of Love by Margaret Craske. Obituary of Margaret Craske from the NYTimes, by Jennifer Dunning, February 23, 1990. Photo of Margaret Craske from Wikipedia. 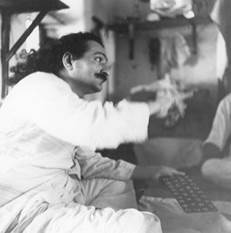 Photo of Meher Baba from Wikipedia; original photographer unknown.